JO-ZERO Type-2, a new mode of JO-ZERO was put on the market. The upper part of the new robot's body is the same that of JO-ZERO and the lower half of the body is the same that of Weekly ROBO XERO issued by DeAGOSTINI. As 22 servo motors are used in the new model, the price (129,150 yen, including tax) increased just 3,150 yen compared that of JO-ZERO with 20 servo motors. JO-ZERO Typ-2 also can be changed to ROBO-XERO by changing with additional hand unit, which is the same unit used in ROBO-XERO. The hand unit will be put on the market soon. JO-ZERO was put on the market in July 2009. 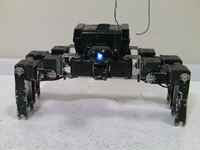 JO-ZERO has been developed for a biped robot kit with 3 purposes, `Cool`, `Speed` and `Human-like` by Nakamura-san, President of Himeji Softworks. The details were described in this blog. ROBO XERO is based JO-ZERO. Servo motors `RS306MD` of Futaba Corporation are used for the robot with 24 axes. The weight is 900 g and height is 300 mm. 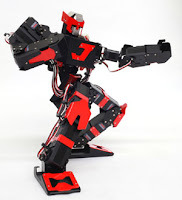 The robot is suitable for the U1K (Under 1 kg) robot fight competition. The details were also described in this blog. 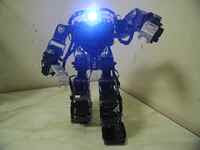 RoboTimes reported JO-ZERO Type-2 Option Unit ‘Sword’ and ‘JO-GUN’ with pictures and videos on Oct 3, 2011 (in Japasese). These units are now developing.